The FTE-1700 is small and light weight. It weighs less than 2 lbs., fits comfortably in your hand and built in a rugged enclosure surrounded by aprotective rubber boot. This feature assist with testing a large number of fibers with similar settings. By pressing just one button the OTDR will test afiber at two wavelengths, save each test and then display both tests for review. Want a larger display, want to geotag yourfiles, or email your traces, use the Bluetooth feature and operate the OTDR with a compatible Android device. The AutoTest feature of the OTDR does a quick test of the fiber conditions, sets the range and pulse width, then produces a trace of the fiber under test. 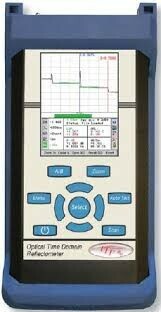 This is ideal to use if unfamiliar with OTDR testing or the approximate length of thefiber is not known. The trace analysis system gives the user the ability to determine quickly if the fiber meets measurement criteria with its Pass/Fail capabilities. Use the video scope with our optional VIS-300 video probe to check and grade (pass/fail) your connectors according to IEC61300-3-35. Onboard file storage for up to 500 traces andfiles may be downloaded to a computer through the USB/PC port. Project reporting and documentation is fast and easy with a Pass/ Fail feature, onboard event table and the supplied report generating software with multi-trace capability.